If a city’s raison d’etre is to make life better — Hyderabad is one of its kind. Hyderabad sits nestled amongst one of the oldest rock systems of the world. Hyderabad is the daughter of Golconda Fort which was built during Kakatiya rule — after the fall of the Kakatiya dynasty and a series of events Golconda Fort fell into the hands of Persians — Qutb Shahi dynasty. When Golconda Fort became congested with people teeming and hygiene could not be maintained, Quli passed a decree ordering the establishment of a new city which should be a replica of heaven on earth and unequalled in the world. Then, on an auspicious day when the moon was in the constellation of Leo and Jupiter was in its own mansion, a city is born — Hyderabad. Since then Hyderabad has attracted people from all over the world for a variety of reasons. 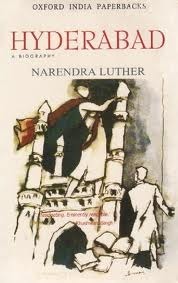 Its climate, its cosmopolitanism, its growth — Hyderabad a biography is living relic of the city, starting with the period prior to the city’s birth in 1591, the book presents an unbroken and colourful chronicle of Hyderabad, one of contemporary India’s most important cities. Charting the city’s fascinating march from Bhagnagar to Hyderabad to Cyberabad, this story is replete with diverse engaging, eccentric and often daring characters, some of whose lives are stranger than fiction! Next: India Through My Lens!